I thought it would be important to share my own discovery of Chiropractic from my first visit experience all the way through my current Wellness visits. I was introduced to Chiropractic as part of the Health Profession after I injured my low back while at practice for my high school wrestling team. I can still remember that day, it was cold Friday afternoon at Gateway High School located in a suburb of Pittsburgh, Pennsylvania. I was 16 years old and a sophomore on my wrestling team. It was near the end of practice when my partner and I tried a new wrestling move. We slipped then fell over another pair of wrestlers in which I ended up on the bottom of the pile. When I tried to get up off the floor, I felt sharp pain in my low back and could not straighten up my posture. The wrestling coach saw that I was in pain and sent me home to rest.When I got home my caring mom helped put ice on my back, gave me aspirin for the pain and had me rest for the weekend. My pain did not go away over the weekend, I still had severe low back pain, so when Monday morning came I could no got to school. My mother talked with my older sister who suggested that I go see Dr. Marshall. Through Chiropractic care he had helped her husband recover after a football injury. Since I was in so much pain, my mother gave me a choice: we could go to the emergency room where they would do an exam then give me more drugs to cover up the pain or go see the Chiropractor to see if he could help. I, like most people who have never been to a Chiropractor, had several questions: What is the Chiropractor going to do? How long is an office visit? Will whatever the Chiropractor is going to do hurt or cause more pain? My mom called Dr. Marshall’s office and spoke with the nice receptionist who answered all of our questions. She told us that the 1st visit would take about 1 hour, it would include an exam and x-rays to see if the doctor could help and reassured us that the adjustments/ treatments would not hurt. My mother made an appointment for that same day. When we went to the Chiropractor, he did exactly as his receptionist had described. I had an exam and x-rays then he stated chiropractic could help my severe pain which was the result of a pinched nerve, also known as a Subluxation. He adjusted my low back which did not hurt but actually felt good. I was truly amazed that the Chiropractor only used his hands to help my injury without the use of any drugs, needles or shots and I did not need any invasive surgery. After several times of going to the Chiropractor to get adjusted, my pain went away and I was able to go back to playing all sports without any restrictions. 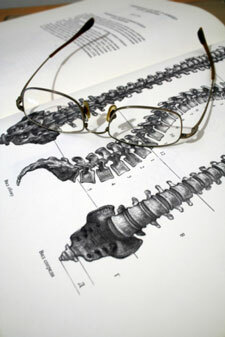 I continued going to my Chiropractor to have my spine condition corrected. Because I was very active in sports, I went in for regular Wellness Checkups, got adjusted when needed. To this day I still continue my Chiropractic Checkups every week. Because I was so impressed with my experience with Chiropractic as part of the Health Profession and that the Doctor only used his hands to Help rather than do any harm to people, I decided to become a Doctor of Chiropractic myself. After 32 years of serving thousands among thousands of patients, I am still determined to reach as many people as possible who need Chiropractic Care and make a difference in every life God allows me to touch. I hope my story will help you, your family or someone you know get Healthy and Stay Healthy for yours and their Lifetime.